First Aid Kits are essential for all workplaces, not only so that you have the necessary supplies in case of an emergency or injury but also to ensure compliance with OH&S regulations. Creating your own kit is easy enough – the tricky bit is ensuring that it ticks all the relevant OH&S boxes. First of all, different types of workplaces require different types of kits. A commercial kitchen, for example, has different First Aid needs than an office. Your kit must reflect these differences, as laid out in the relevant OH&S guidelines. The next thing you need to ensure for a DIY First Aid Kit is that your kit is the right size for the amount of employees in your workplace – there are, once again, OH&S First Aid guidelines to advise on this. Excellent, DIY Kit done hey? Well yes, but you now need to ensure that none of the items are past their expiry date and that the kit is always restocked whenever any first aid supplies are used. All things considered, an OH&S compliant First Aid Kit is not as easy as it sounds. So, does this make a Managed First Aid Kit a better solution for your workplace? Well, most importantly, a fully managed First Aid service means you always have the supplies you need to properly treat any workplace injuries and accidents. There’s no searching through your first aid kit for a bandage that simply isn’t there. And then there’s OH&S compliance – a managed First Aid service is the easiest way to ensure that your kit meets the OH&S guidelines specific to your state, industry and workplace size/layout. 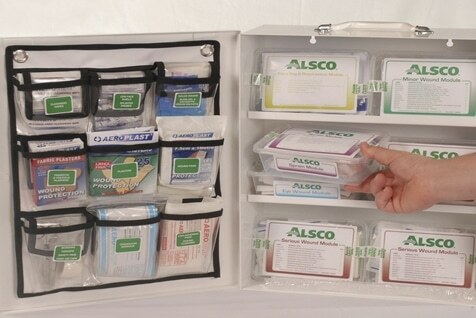 Alsco’s managed first aid service offers a full range of first aid kits – from food industry specific to mobile kits – and provides regular restocking with hospital grade first aid supplies. The rental system removes the financial burden of capital outlay and depreciation, replacing it with a tax deductible service. That certainly sounds like a better solution than trying to do it yourself! So why wait to get them for your workplace? Right!